John Fletcher Ankeny was born in Somerset, Pennsylvania on May 6, 1824 to Joseph and Harriet Susanna Giese Ankeny. He was their first child. He received his middle name, Fletcher, from the family who helped raise his mother, Harriet Susanna Giese, after her own mother died when she was a child. When he was seven years old he moved to Millersburg, Ohio with his parents and three brothers in 1831. John Fletcher Ankeny received formal education at a medical college in Cincinnati, Ohio. He practiced medicine and was the postmaster in Kenton, Ohio. His adventurous spirit took him and his brother, Henry Giese Ankeny, to California during the Gold Rush. While in California John Fletcher Ankeny was a physiciain but also became a Clerk in the first legislature in California. He also sailed to Hawaii where he learned about growing "pines" (pineapples). His father, Joseph, was a major influence in John's life. When Joseph summoned his son back to Ohio to find a wife, marry and settle down -- John did so. Sarah Hager "Sally" Wolgamot married John on February 7, 1856 in Millersburg, Ohio. They moved to land in Illinois and established residence and a farm. His brother Rollin and his family also moved to Illinois. While living in Illinois, John and "Sally" had four daughters. John Fletcher was a huge supporter of Abraham Lincoln and participated in his presidential campaign and at the same time ran for political office himself. He became a member of the Illinois Legislature from Stephenson County, Illinois in 1860. John's father purchased land in Iowa and after the Civil War the Ankeny family made big plans to move to Iowa. John moved his family to Des Moines, Iowa in 1869. He quickly was elected to the Des Moines City Council. His business and political connections led him to invest, along with Mr. Fred Hubbell in the Minnesota Narrow Gauge Railway. that would traverse from Des Moines northward in 1875. His business instincts propelled him to buy land along that route, knowing that towns prospered where the railroads existed. There he built a post office, boarding room and a house. The land was platted under the name Ankeny. The town was named Ankeny. Although John built a house there, he and his family never did live there. They continued to live in the growing and thriving business community of Des Moines. The narrow gauge rail company he founded with Mr. Hubbell ceased to exist when the standard gauge railroads became the norm. John Fletcher turned his sites to other ventures. A letter from John Fletcher to his oldest daughter, Florence, dated May 30, 1880, describes his life out in the wild southwest near Silver City. The letter is a revealing look into the heart and mind of John Fletcher. His letter states "I have not come across what I am hunting for". ​John returned to Iowa and quickly turned his attention to Florida. He was determined to establish a pineapple plantation in Florida and he did. He bought land and established a town and named it Ankona. Many members of John's immediate and extended family visited and moved to Florida. John and his wife, Sally, continued to maintain a residence in Des Moines. They lived in a home on Sycamore Street which later was named East Grand Avenue. The home was located just a few blocks from the new Iowa State Capitol. John Fletcher died in Florida on April 9, 1886 at the age of 61. He was buried in Woodland Cemetery in Des Moines, Iowa. As of February 23, 2016 John Fletcher had 40 (known) descendants: 4 children, 4 grandchildren, 5 great grandchildren, 11 GG grandchildren, 14 GGG grandchildren and 2 GGGG grandchilden. Florence Ankeny married George Peter Russell and they had one son Fletcher Ankeny Russell. George Russell died as a young man and left Florence as a young widow with a toddler. Florence worked her way up from "Paper Folder" to "Assistant Law Librarian" at the State of Iowa Capital. She was one of the first paid female employees for the State of Iowa. She lived down the street from the Capitol at 824 East Grand Avenue. 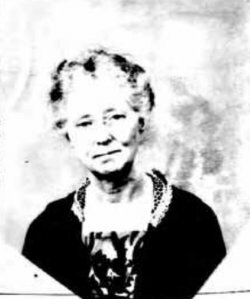 Florence and her son, Fletcher, spent time in Ankona, Florida where her father had bought land and established a pineapple plantation. Fletcher continued to live in both Iowa and Florida. Mary Bird Ankeny married Mr. Benson Ehret Israel and they had one son -- William Dwight Israel. Mary Bird and Benson operated a store and business in Centerville, Iowa during the early years of their marriage. Their son William was a newspaper writer-reporter-solicitor in New York City. In the 1940's he changed his last name to Dollison. Harriet Giese Ankeny married Mr. Delos Mott, a wealthy land owner, when she was 31 years old and he was 63 years old. Harriet took over Mr. Mott's duties as Trustee of the Agriculture College in Ames, Iowa when he died. Harriet traveled the world including France, Panama and Argentina. They had no children. Harriet's nephew, Fletcher, married Harriet's husband's niece, Grace Mott. Susan Ankeny married Mr. Ernest Warren Brown. Mr. Brown was a very successful and prominent businessman in Des Moines. Mr. and Mrs. Brown traveled the world and started a collection of marine specimens of museum quality. This collection was displayed in the Brown Hotel which they owned and operated. They lived on the top floor. They had two sons. One lived to adulthood and married Greta Weitz. They too traveled the world and were leaders within Des Moines. Susan Ankeny Brown and Greta Weitz Brown were active in women's clubs, the arts, and social circles. You can hear Robert Brown and his wife Greta tell about their lives, the Brown Hotel, their ancestors and the history of Des Moines, Iowa in an enlightening interview as part of the Oral History Collection at the Des Moines Public Library. John Fletcher Ankeny purchased a large parcel of land about eight miles south of Ft. Pierce, Florida overlooking the Indian River in 1883. He dubbed his property -- Ankona. John Fletcher Ankeny never took up permanent residence in Florida. However, many members of his family did move to Florida, started businesses and built beautiful homes on Indian River Drive which are now on the register of historic homes. Ankeny descendants continue to live in Ankona, Florida. The Ankona Museum has a significant display about the Ankeny family. ​the grandson of John Fletcher Ankeny, in Ankona, Florida. Circa 1890. This is the home lived in by Fletcher Ankeny Russell. Note the bay window on the second floor. The following is a transcription of a newspaper article that provides excellent commentary about the John Fletcher Ankeny influence on Ankona, Florida and the life and times of his grandson, Mr. Fletcher Ankeny Russell. The journalist was a well known writer and historian in the St Lucie County area. Ankeny is spelled Ankony in this article. The original newspaper was found in the S H Brown collection and transcribed by K Wright in July of 2016. The date of the article is about 1958 and states that Russell is in his eighties, he died in 1968 at the age of 91. Every morning for a week, a small boy of six went out to keep watch on the ridge over looking the river in front of his grandfather’s home. It was the year 1883, the first steamboat carrying passengers was due down the Indian River, and young Fletcher Russell didn’t want to miss seeing it. His post of watch was marked on government maps as “Dr. Ankony’s home”, for Dr. John Fletcher Ankony was the lad’s grandfather. The same area is marked on all maps today and is known as the community of Ankona, having been named for this early pioneer. Fletcher Russell was born in 1877 in Des Moines, Iowa. His father had died when he was still a baby, and now he and his beautiful young mother had come to spend a year with her father in this undeveloped part of Florida. They traveled by rail until they reached Jacksonville. There they boarded another train for St. Augustine, then traveled by ste(erage) to Palarka. Mr. Russell recalled that a wagon was backed down into the river so that the passengers could disembark from the boat right onto the wagon. They were carried to Titusville where they stopped overnight in the old Indian River Hotel. From Titusville they sailed to Ankona with the mail carrier in his sail boat. This portion of the journey took two days for they stopped at every settler’s home along the river. Peter Cobb and Milton Card were living in a tent on Mr. Card’s property four miles south of Fort Pierce and north of Ankona. They often came to call on the Ankonys and the young people who were staying there at the time had a joke about “Mr. Cobb came to call and left his Card, and Mr. Card came to call and left his Cobb.” Little Zora Card, who became a famous circus queen and animal trainer in adult life, was about four years old at the time. Mr. Russell remembers her as being plump, pretty, and with blonde curls. When his family would sail up to Fort Pierce to shop, they would leave him at the Cards to play with little Zora. There was an old pirate living on the island south of the House of Refuge. He was a very strange character, about eighty or ninety years old, and was the survivor of one of the shipwrecked Spanish pirate ships. His skin was as brown and wrinkled as an elephants. His only name, as far as the settlers could find out was “Portuguese Joe.” He lived in a palmetto shack, had a few chickens, and of course never wanted for food with the plentiful supply of fish, wild hogs, bear, and other wild game. There were many wrecks in those days and Portuguese Joe found it very profitable as well as fun to search the beach for the wrecked cargo. He gave young Fletcher an …….. Russell still has it in his possession. On Washington’s Birthday the settlers celebrated with a picnic on the island across the river from Ankona that was known as Eden Trail. It was a community picnic and Herman’s Bay was ablaze with sails as the people sailed down the river, many of them coming from as far away as Titusville. This picnic became an annual celebration and was continued until 1907 when the bottom fell out of the pineapple industry and many of the settlers had to move out from the river ridge or starve. Mr. Russell’s grandfather owned about a mile along the river. At that time his house was a structure sixteen feet wide and twenty-four feet long. He also had a palmetto shack build along the side of it. Clearing the land was extremely difficult for the pioneers did not have our present day bull-dozers and other mechanical giants to do the work for them. It was done by hand and all of the old timers will remember the vine that added to the clearing difficulty and was called “hell and damnation vine”. Mr. Russell has lived at Ankona off and on all of his life. His permanent home is there on the same property originally owned by his grandfather about eighty years ago. He loves the river and really gets “his dander up” over the changes that have come about to the detriment of the wildlife, the fish supply and the navigation of the river. Mr. Russell is, himself, a rather colorful character. He is a very outspoken man. . .one never has to wonder how he stands on a matter. This type of person is very admirable in my estimation. One can be comfortable around him, for while you may not always agree with him, you at least know what he thinks about matters of importance and are not kept in the uneasy state of wondering what he is thinking. His views on conservation of the river-life should be of interest to all, and, I hope, of influence with “the powers that be.” For Mr. Russell knows from his years of living on the river, his long period of study and observation, that something must be done and done soon or this area will recede in the minds of sportsmen as a fishing paradise. He believes that all seining should be stopped, that the city refuse should not be dumped into the river to pollute it and the fish living there. He would like to see the Indian River made a game and fish preserve so that in just a few years it would be working alive with thousands of fish as it was just forty years ago. He would like to see those in charge of deepening the channel, not dump the dredged sand from the channel back into the river near the west banks. This was done the first time, and these loads of sand in the river together with the east winds and tides slowly moved the sand closer to shore so that in the summer months sand bars appear all along the river near the west bank. Mr. Russell can recall that at one time all the river settlers had docks sixty to seventy feet long, from Jensen to Fort Pierce. In 1910 he owned a launch that drew two feet of water and he could land at any of these docks . . .This would be an impossibility today. Fletcher Russell is an avid reader. He keeps abreast of all that is new in fiction, the literary field, and in current world happenings. He has been a farmer, a pineapple grower, a college professor, and an actor. The last is the way I always think of him, for he has the scholarly, dramatic appearance of a Shakespearean actor. It is fun to look through his scrapbooks and see the play programs with the autographs and messages written by the leading actresses of that time. Mr. Russell also has a Civil War scrap book that was made by his great aunt. The clippings were pasted into an old account ledger where an order for coffee could be seen entered at twelve and a half cents per pound. Imagine! Mr. Russell paints and does sketches in black and white as a hobby. Though he has lived alone most of his life he readily admits that “people” interest him more than anything else, and he has gleaned a great store of interesting personalities as friends in his extensive traveling throughout the country. A man of definite opinions, a keen sense of humor, a vivid manner of expressing himself, completely unpredictable and at times almost shocking, Mr. Russell, approaching his eightieth year, is again an example of the stalwart stock our pioneers were made of, and today we pay tribute to him and his ancestors for whom the community . . . Ankona was named . . .
Rollin Valentine Ankeny moved to Ankona, Florida. 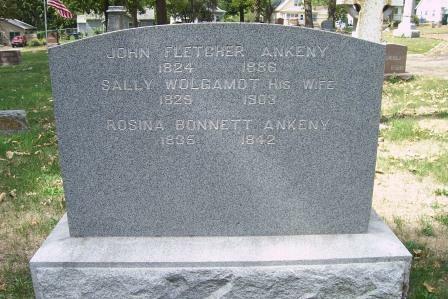 This R V Ankeny was NOT the brother of John Fletcher Ankeny. This R V Ankeny was the nephew of John Fletcher Ankeny -- the son of Henry Giese Ankeny. He built a home on South Indian River Drive in Ankona. Rollin is listed as a Fruit Farmer of Pineapples and Oranges in 1910. He was postmaster of Ankona. Rollin and his wife, Edythe, are buried in Palms Cemetery, Ankona, Florida. Their two children lived in Florida. This home was built by and lived in by Rollin V Ankeny, nephew of John Fletcher Ankeny. Peter Dewalt Ankeny, brother of John Fletcher Ankeny, moved to Ankona in his later years. In the 1910 census Peter Dewalt Ankeny was listed as a Fruit Grower and Pineapple Farmer and his son, Paul Lorah Ankeny, was listed as a Laborer, Pineapple Farm. Peter's daughter, Rose Bonnet, married Edgar Lewis. Rose was educated at the State University of Iowa. They moved to Florida in 1901 and made Florida their home. She worked for the Florida University Extension Department and was Superintendent of Schools for St Lucie County, Florida. She was a Regent of the Daughters of the American Revolution, Cora Stickney Harper Chapter. Peter and Ellen Ankeny are buried in Des Moines, Iowa and three of Peter's children are buried in Des Moines. Only Rose is buried in Florida at the Riverview Memorial Park, Fort Pierce, St Lucie County, Florida.